The corrugated wall structure of a cardboard box refers to its layers—the combination of liners and fluting profiles—to create a durable wall of ideal thickness. The thicker the wall makes the corrugated box more durable, but sacrifices flexibility. At the point where corrugated packaging does not need to protect or support, microflutes become a more viable option. Corrugated medium with only one liner. Doesn’t offer much sturdiness, but the low production cost makes it ideal for adding extra cushion to already packaged products. 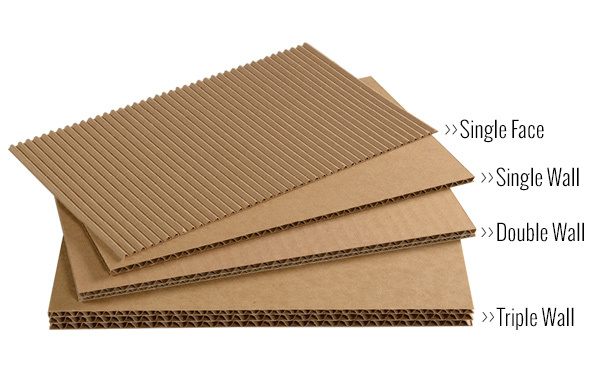 Like Single Face Board but with an additional liner, creating a corrugated cardboard sandwich. Most boxes are going to be Single Wall Board, especially the corrugated E-flute boxes one finds at a trade show. A team up of two different corrugated wall structures for reinforced durability. Perhaps you want the strength of an C-Flute wall with the customizable presentation of an E-Flute corrugation. This would be labeled a CE board. Three corrugated wall layers of cardboard for maximum reinforcement. Can be three different types of fluting, but usually one type sandwiched between two identical types. Think ABA or ECE.